So, I am thrilled to be able to offer yet another giveaway from Tropical Traditions to you all today! I know that you all are huge fans of this amazing company (as am I) and hope that you will enter! Before we get to the giveaway, let me tell you a bit more about Tropical Traditions. Have you ever heard of Gold Label Virgin Coconut Oil? I didn't until I began working with Tropical Traditions and ever since then, I have used it in my kitchen for recipes and cooking. As I have mentioned before, my favorite way to use this coconut oil is for making pancakes. It adds so much flavor to the pancakes and is so healthy for you and your family. 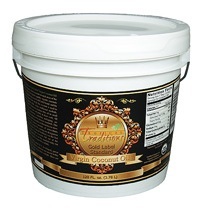 Tropical Traditions specializes in their famous coconut oil and they are known for their attention to detail when it comes to making, processing and packaging their products. I do trust them to give me their best, and I know that is something that they strive for as a company. Here is a brief, 3 minute video about Tropical Traditions and their AMAZING Gold Label Virgin Coconut Oil. Please, take a minute to watch it! Are you aware of all the uses for coconut oil? I was really surprised to find that you can add it to beverages like coffee, hot chocolate and smoothies. Also, you can use it for making candies, puddings, muffins and other baked goods. My mom likes to add it to oatmeal and it really helps to add alot of flavor...she loves it! Now that I know of more uses for this fabulous oil, I am going to give it a try in some of my baking...I am sure it will add loads of flavor and nutrients!! All of this information and more can be found on Tropical Tradition's website and you can also purchase their products directly from their site as well. the whole wheat bread recipe. I'd like to try their Chocolate Coconut Macadamia Nut Bark recipe. I'd like to make the Flour Free Coconut Cookies. I would like to try the GF Black bean Brownie recipe! I'd like to try the Chocolate Coconut Macadamia Nut Bark. Yum yum!!! kristiedonelson(at)gmail(dot)com Thank you. Lemon coconut frosting sound sooo good! Thanks! I'd like to try the Flour Free Coconut cookies. The chocolate chip cookie dough truffles look delicious! GREAT PRODUCT,I LOVE IT! THANK YOU. I would love to try the coconut shrimp. Thanks for the chance to win! Savory cheese scones with coconut flour... craving cheese now! cheese scones with coconut flour sounds like a delicious recipe... craving cheese now! I would to try the coconut oil french fries recipe! I'd love to try the Chocolate Coconut Macadamia Nut Bark Recipe! Hello, I would love to try their Flour Free Coconut Cookies. Thanks for a great giveaway! I would love to try the Healthier Peanut Butter Balls recipe! I would love to try the Coconut Hush Puppies Recipe! So excited about this giveaway! I would like to try the Chocolate Chip Cookie Dough Truffles recipe...yum! I would love to try the Easy No-Bake Coconut Cream Cheesecake Recipe. I'd like to try the flourless coconut pancakes. Who can pick one! I've already copied down about 10 of them to try! :-) But I think the first will be Coconut Peanut Butter Brownies. And maybe the peanut butter balls with almond butter instead. YUM! I'd love to try to make my own coconut milk using dried coconut. I always seem to run out! I would like to try the Chocolate Chip Cookie Dough Truffles recipe. We love Peanut Butter balls so I would love to try their healthier peanut butter balls! The easy creamy coconut pineapple ice cream sounds wonderful! The Chocolate Chip Cookie Dough Truffles look yummy! The Lemon Coconut Frosting sounds delish! I'd make the Coconut Chicken Curry Stir-fry! Almond Butter Freeze Fudge just sounds exciting to me, smooth , rich and creamy, yummy! I would love to try the Grain Free Banana Nut Granola recipe.